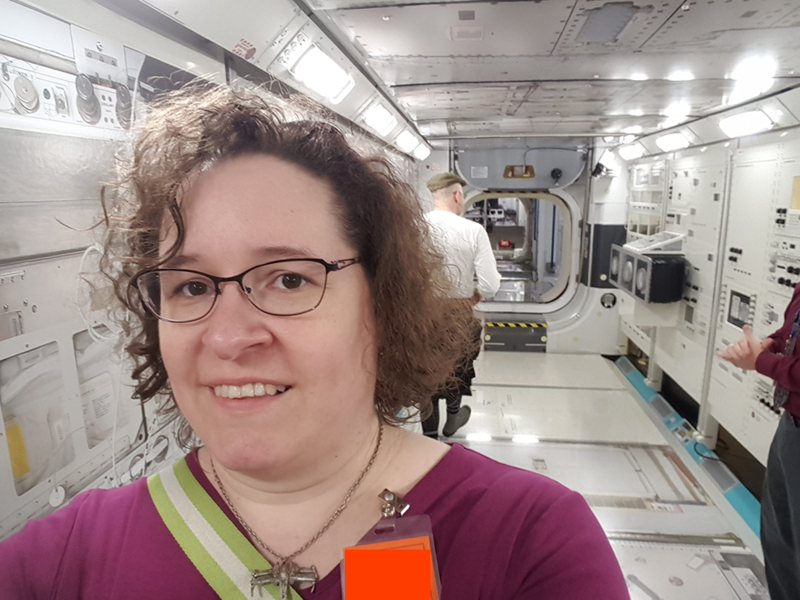 Sometimes, living in Houston has unexpected perks, as when some old friends turn out to also be former NASA researchers who can request VIP tours for visiting science fiction authors. My group, the Houston Science Fiction and Fantasy Writers Meetup, hosted a writers workshop with Chris McKitterick, director of the Gunn Center for the Study of Science Fiction at the University of Kansas, Lawrence. As part of his visit down here, the coordinator of the workshop arranged a VIP tour of NASA’s Johnson Space Center. We met at Rocket Park, which is a public access area, coincidentally next door to the grazing fields for NASA’s prize longhorns. Ah, Texas – where every unused acre is used for grazing cattle. 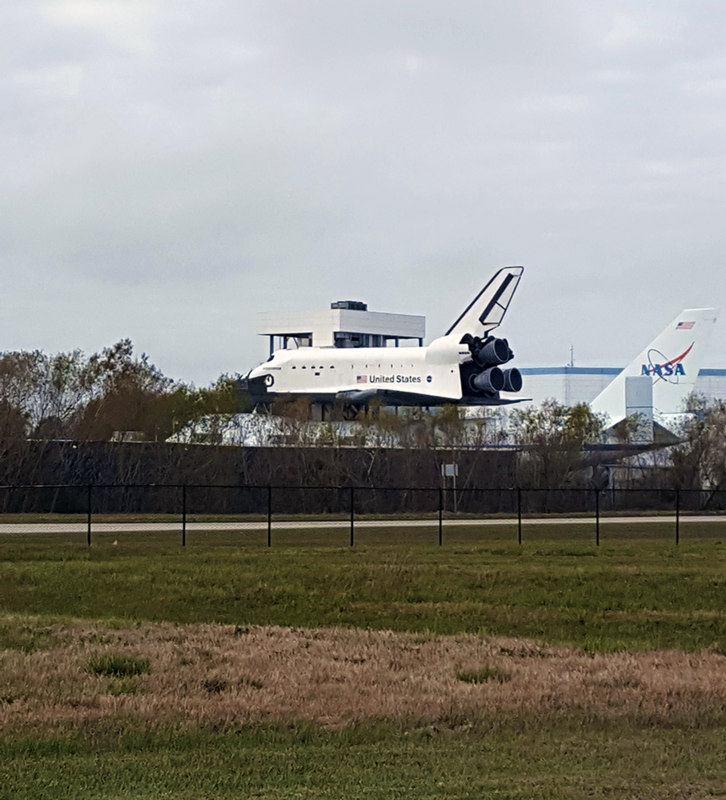 From Rocket Park, we had a great view of the new installation at Space Center Houston – the Shuttle Mockup still mounted on its modified Boeing 747 Shuttle Carrier Aircraft. The Shuttle mock-up Houston received for display, still atop the modified Boeing 747 Shuttle Carrier Aircraft. 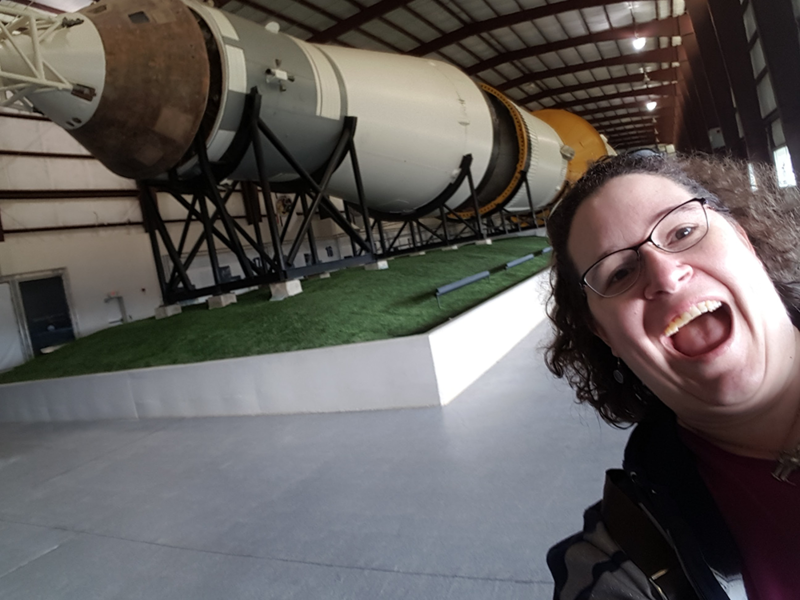 It’s me, with the Saturn V rocket! It’s inside a big hangar now, but I remember being a kid when it was just laid out on the grass in the open. 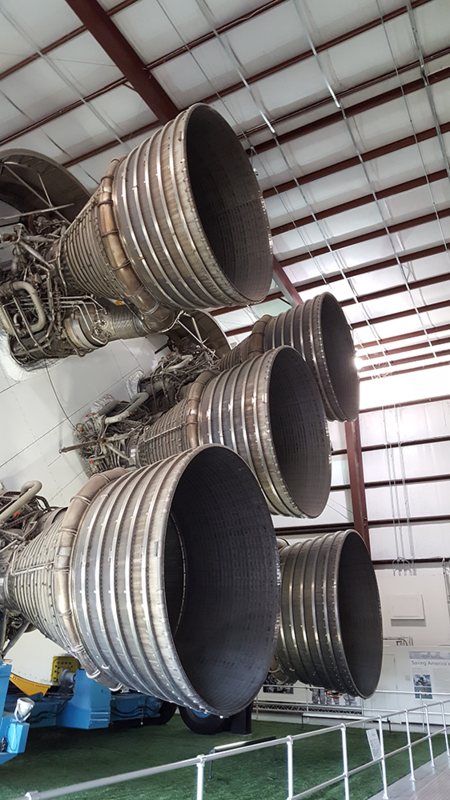 Five engines from the Saturn V rocket. 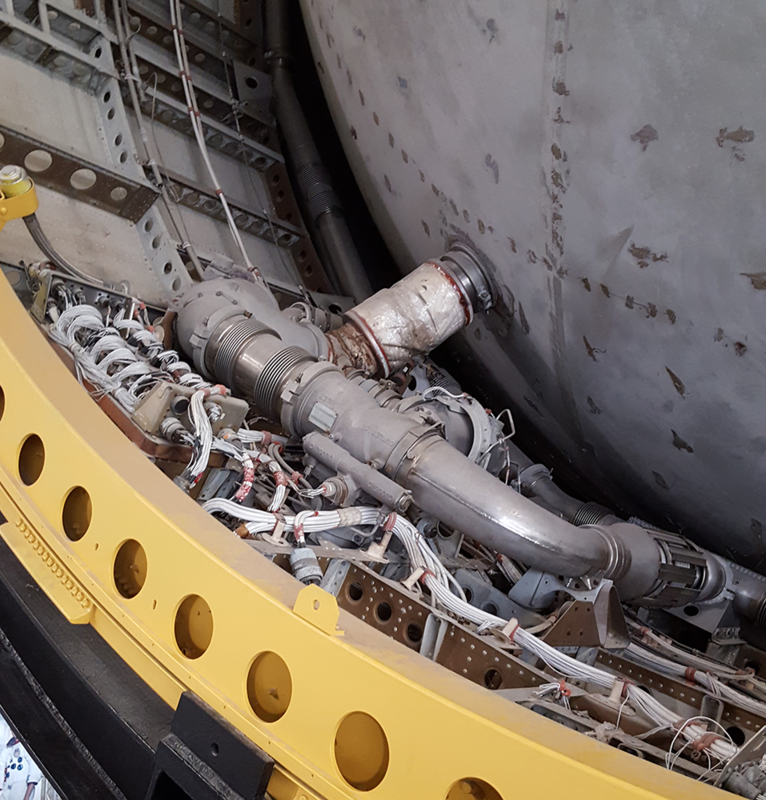 Some visually interesting bits of the Saturn V rocket in Rocket Park. From the entry, we went to the Mission Control Center, where we got to observe the MCC for the International Space Station during the end of the astronauts’ day on board. The screens were mostly pre-recorded things, from the space walk earlier in the month, preparing for a later task. Second view of the screens of the ISS Mission Control, with recorded data from previous spacewalks. 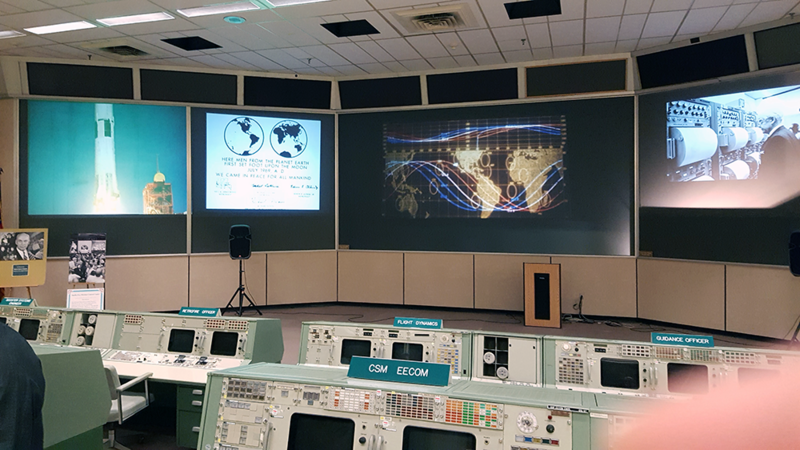 Then came the bonus round: a visit to the floor of the Historic Apollo Mission Control Center. We got to take the side door and explore the room inside. It was awesome. Dom showed us where he would have sat once, as Flight Surgeon for shuttle missions. We took a look at the red phone at the DoD station. Each desk has pneumatic tubes so that messages and reports could be written down and sent to another station quickly. Buttons and levers and tiny monochromatic screens: yet this was the Mission Control in use for decades. The funny thing was that a tram tour from Space Center Houston came in to the observation lounge behind glass while we were there, climbing all over the old green machines and beige carpeting. One thing: the steps between levels are SUPER tall – everybody in there must have had amazing quads and well-fitting pants. 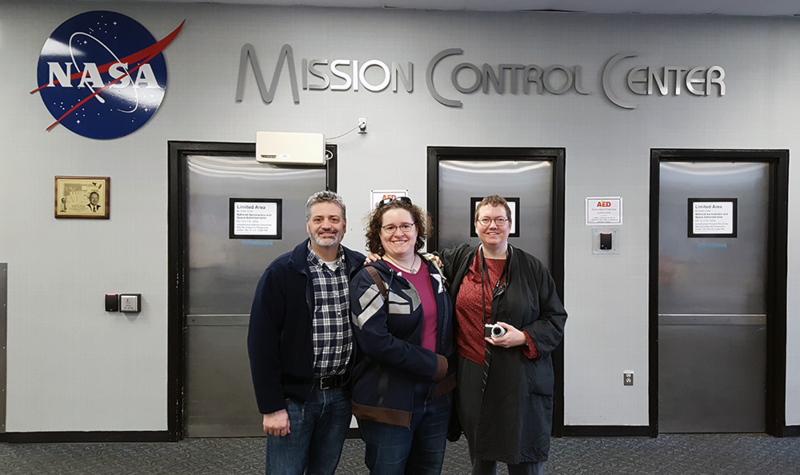 Dom, me, and Antha at the photo op entry for the Mission Control Center at Johnson Space Center. 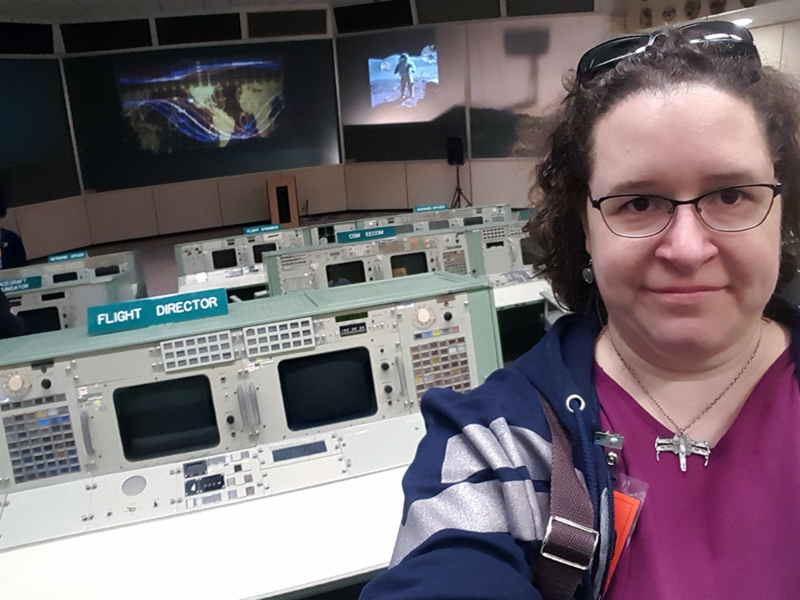 It’s me, at the Flight Director’s station of the Historic Apollo Mission Control Center! Sweet. 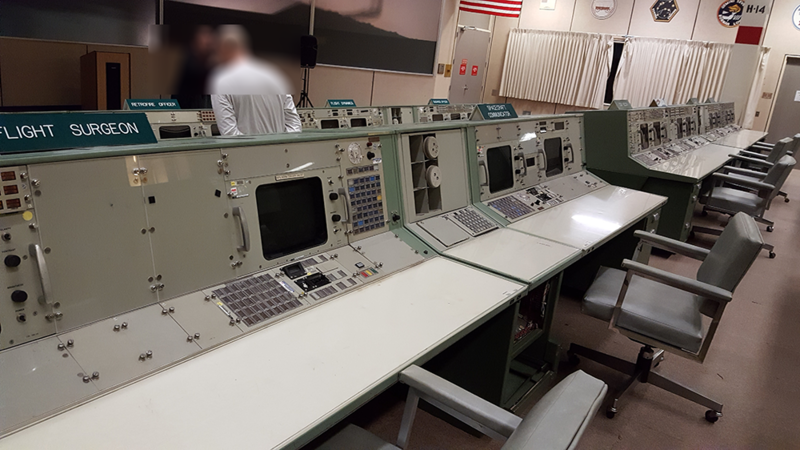 Flight Surgeon’s Station and others at the Historic Apollo Mission Control. The red phone at the Dept of Defense station in the Historic Apollo Mission Control. 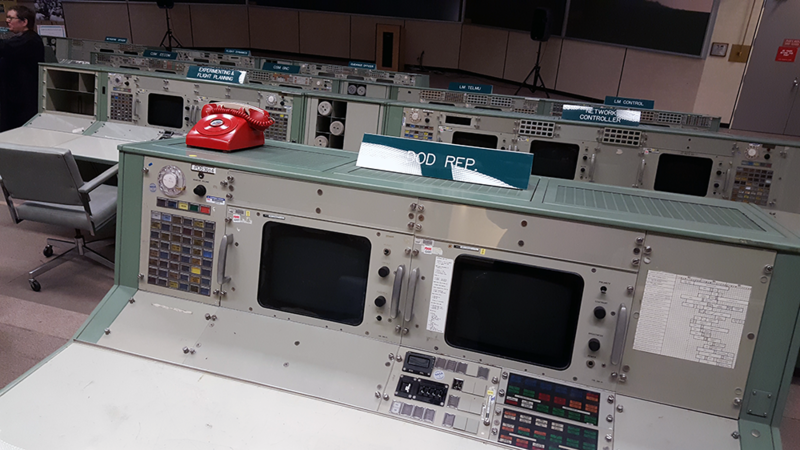 Down on the floor of the Historic Apollo Mission Control Center with various historic displays and much of the original equipment. 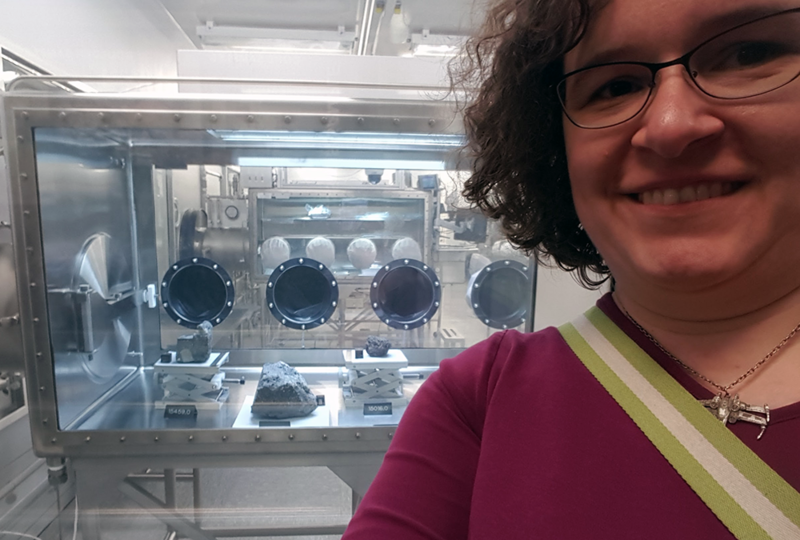 From the MCC, we went to another building where we got to see the NASA Moon Rock Lab. The lab is a clean room, but there was an observation room for us behind glass. 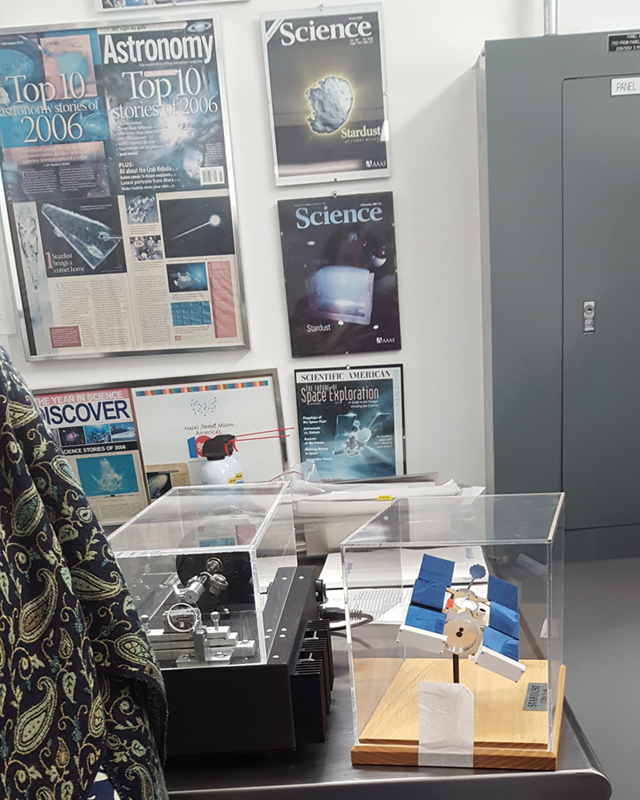 There were moon rocks on display, as well as many in storage. They continue to be used for research all over the world. In a different part of the same building, we encountered the Stardust project. A small team built a spacecraft to collect particles from the tail of a comet, as well as interstellar dust. They’ve already discovered amazing things examining the most minute slices of these bits of dust. I got a lot of artistic inspiration looking at the high-magnification photographs all over that lab. Beautiful science! Clean Lab for the moon rocks collected during the Apollo Missions. They and their data are still being used for research all over the world. 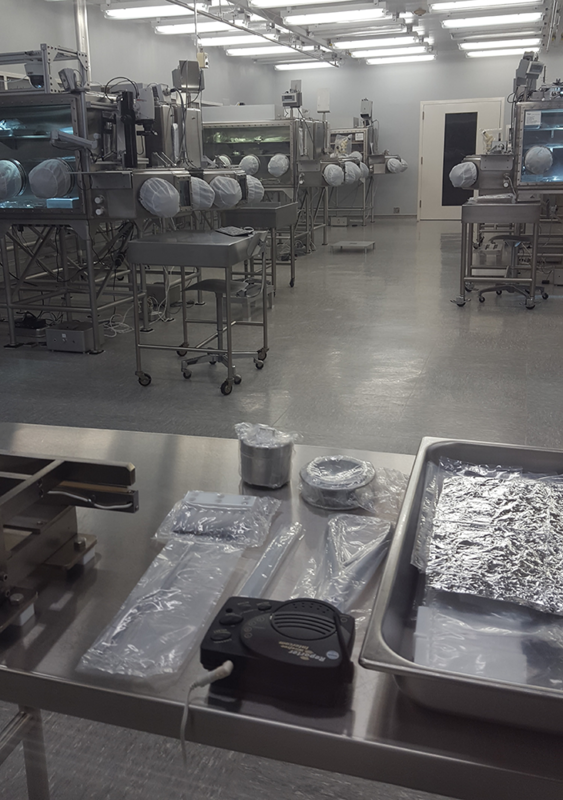 Taken through the window of the clean room for the moon rocks. These are some of the more famous ones, near the observation station. 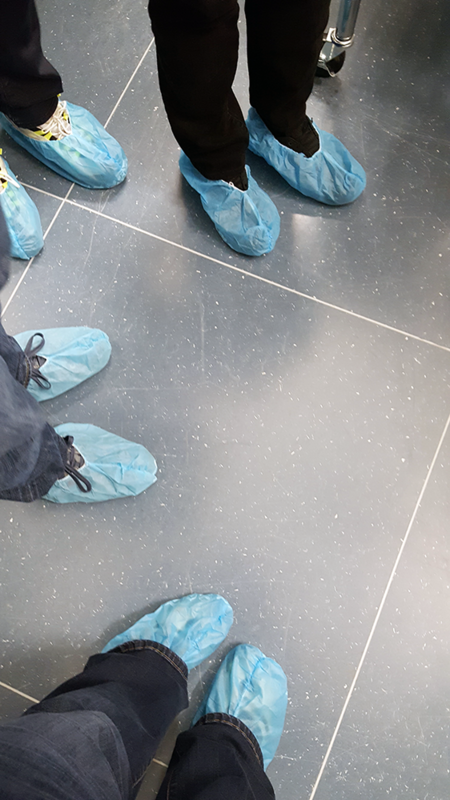 We got to wear paper shoes in the partial clean room. Magazine covers and a miniature model of the StarDust space vehicle. 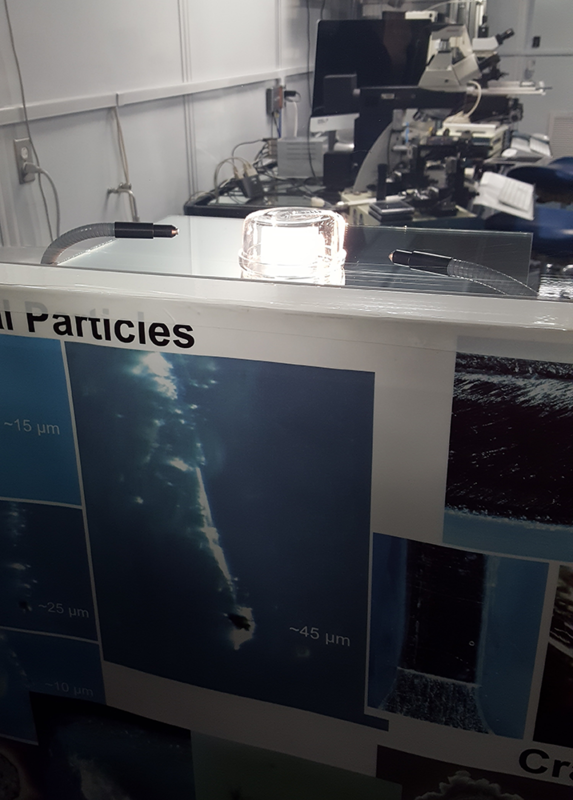 One of the cubes of gel matrix and photos of particle paths in the StarDust Project lab. The high magnification images of stardust caught in special matrix. 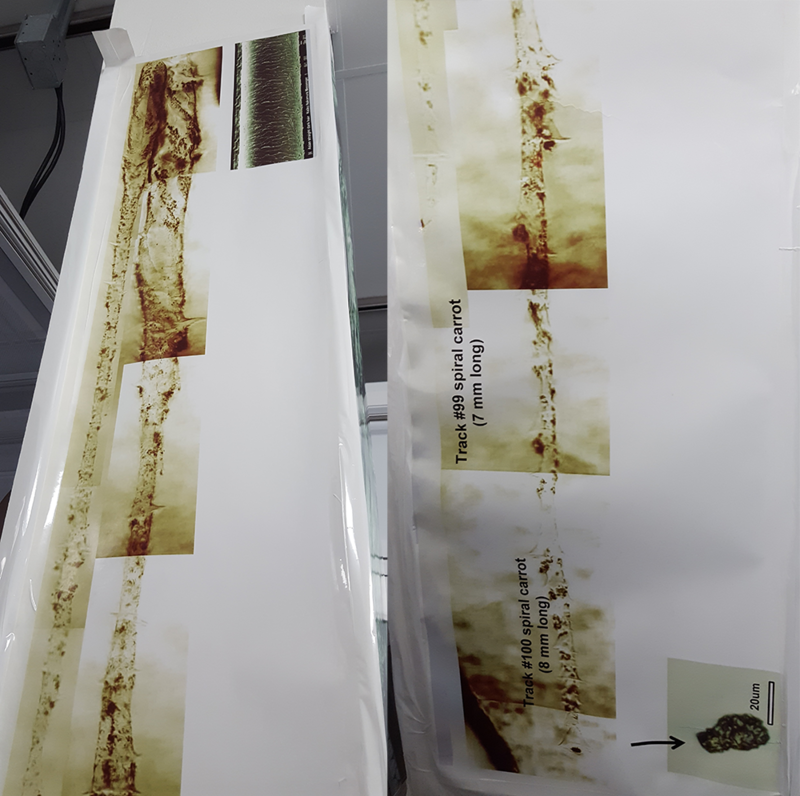 At the top, on the left side, the stardust channel is next to a human hair at similar magnification. High magnification photo of the particle path in the gel matrix of the StarDust project. 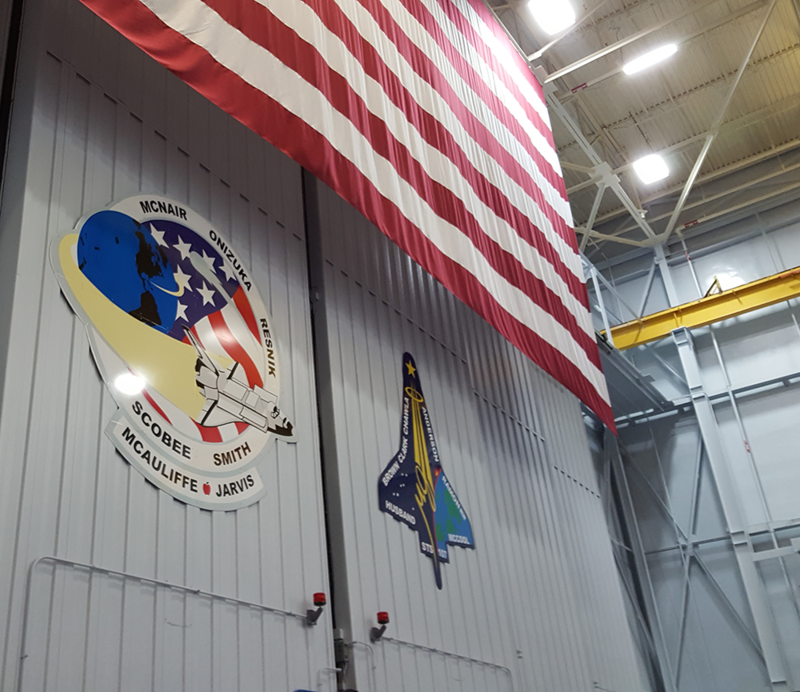 Finally, we were escorted to the Training Hangar where we got to traverse the interior of NASA’s International Space Station module mockups. Wow! That was amazing, and full of interesting bits of knowledge for the science fiction writer. 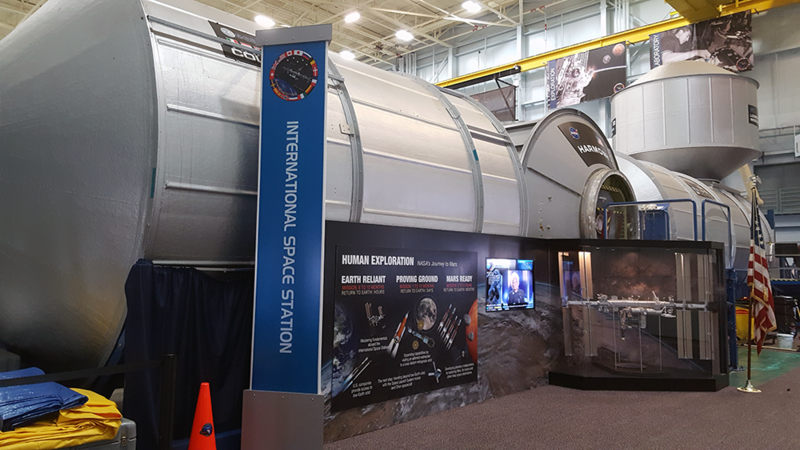 We got to peer into the training mockups for the new Orion spacecraft, and the Soyuz that currently takes astronauts to the ISS. There was a lot of intriguing hardware to examine and exciting question to ask. Once we finished in the training modules, we headed out to the NASA gift shop before returning to our cars at Rocket Park. On the whole, a fantastic day out, with excellent people. 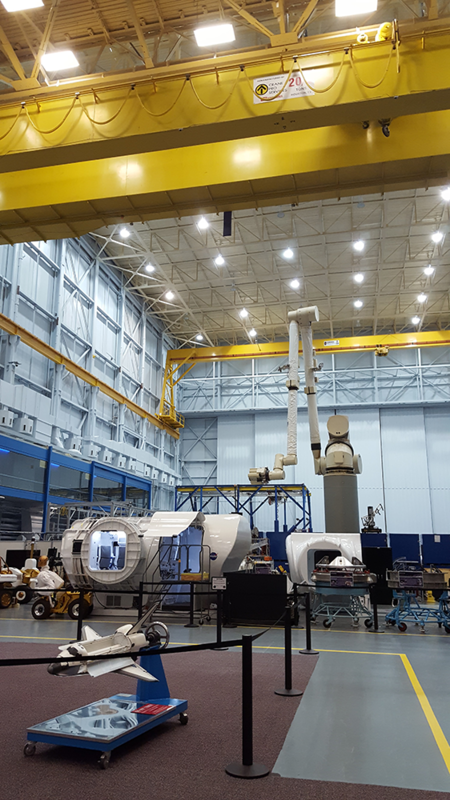 Exteriors of the training modules of the International Space Station. 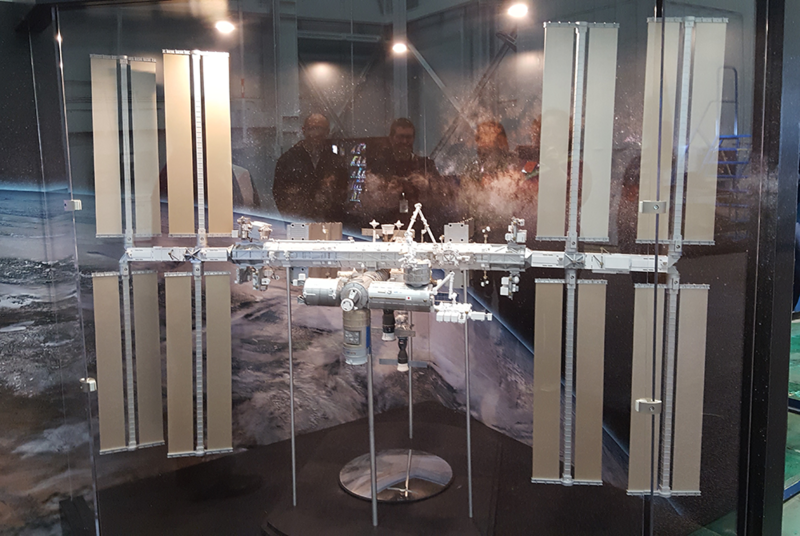 The display model of the International Space Station on the floor of the training hangar. The mission badges for two lost shuttles. 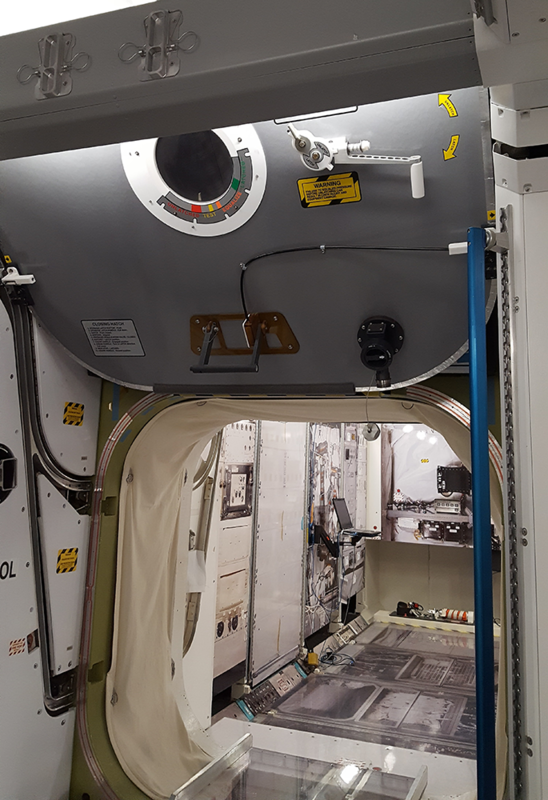 Inside the Japanese ISS module, which is mostly low fidelity for initial training runs with the astronauts. 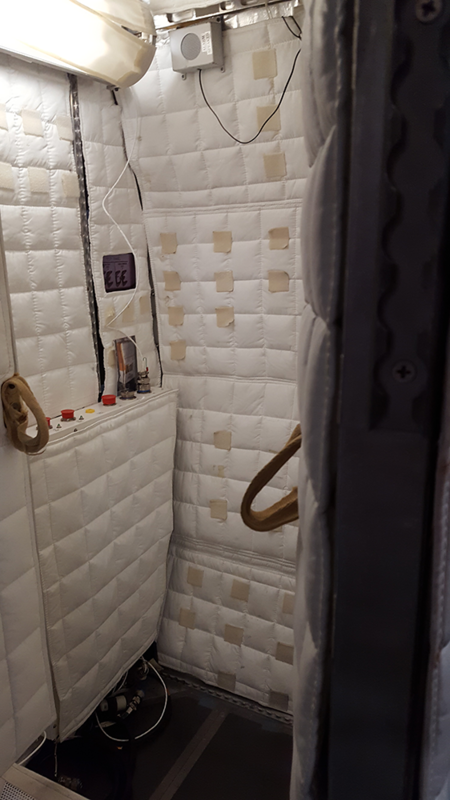 High fidelity sleeping compartment in the ISS training module, with specialized air flow patterns to prevent CO2 buildup. 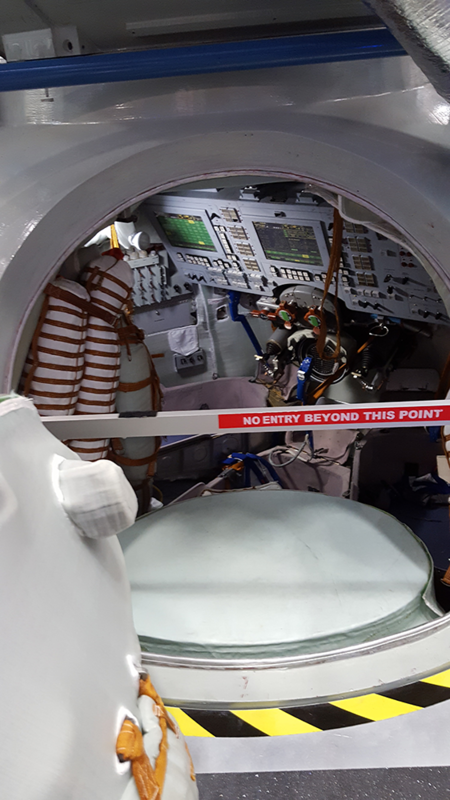 Interior Hatch in the training module of the ISS. 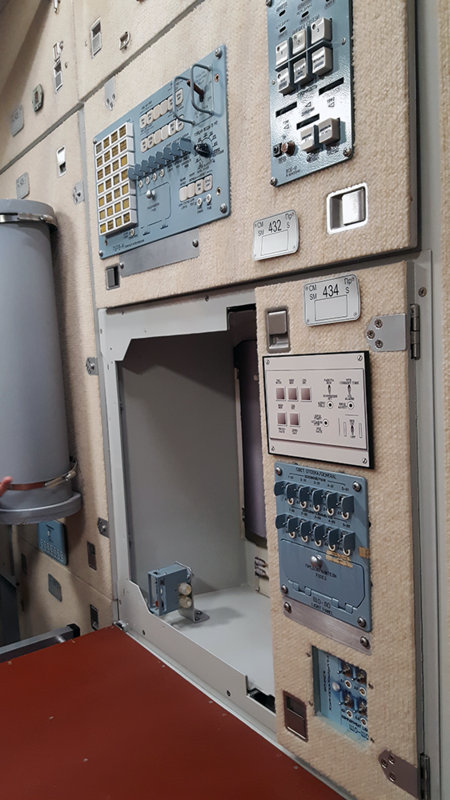 Part of the kitchen set-up of the training module for the Russian segment of the ISS. That is carpeting on the walls, just like it is in space. Egads! The far floor of the training hangar, with the old equipment. Astronauts are launched into space aboard this tiny tiny capsule on top of a rocket. 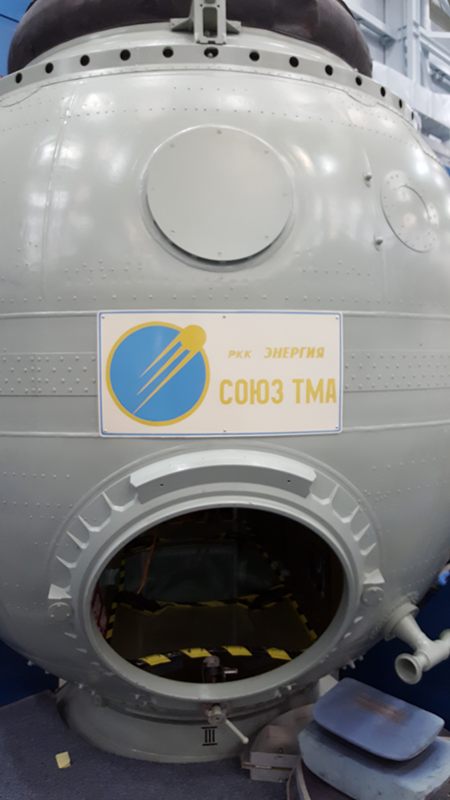 Exterior of one half of the Soyuz capsule, which currently carries astronauts to the ISS. 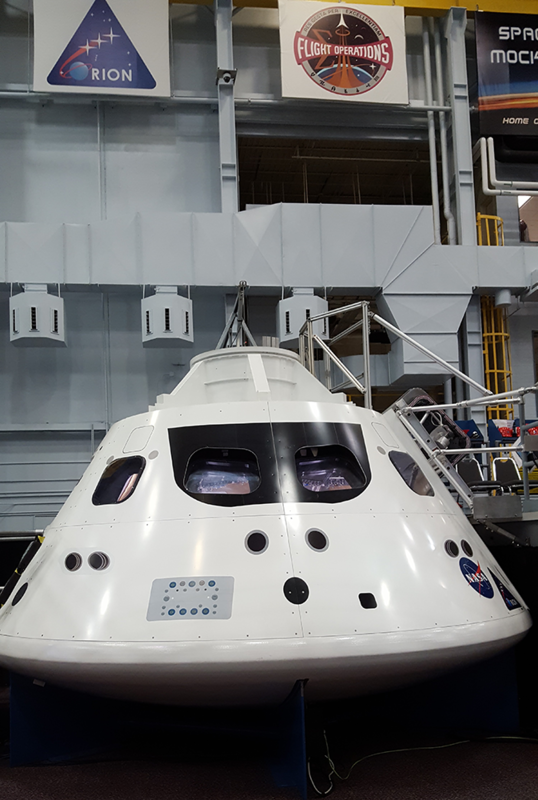 NASA’s new Orion capsule, for use to get into space on the new Orion rockets. It will carry 4 astronauts to spacecraft in orbit, and thence to the moon or to Mars. 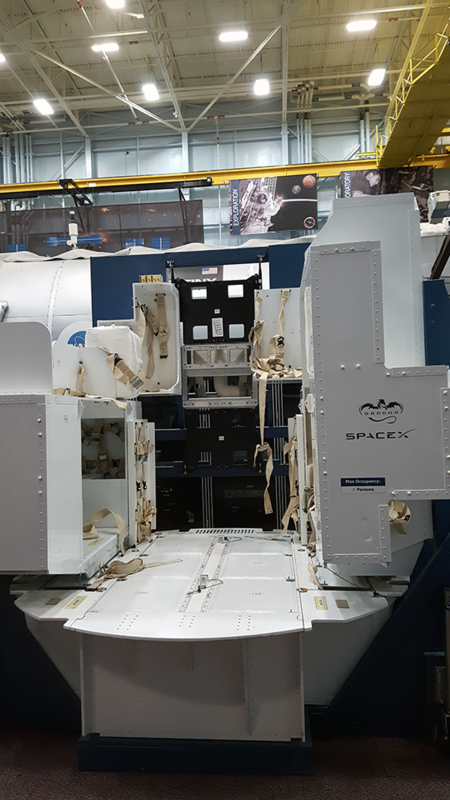 Training module for the SpaceX Dragon cargo vessel. 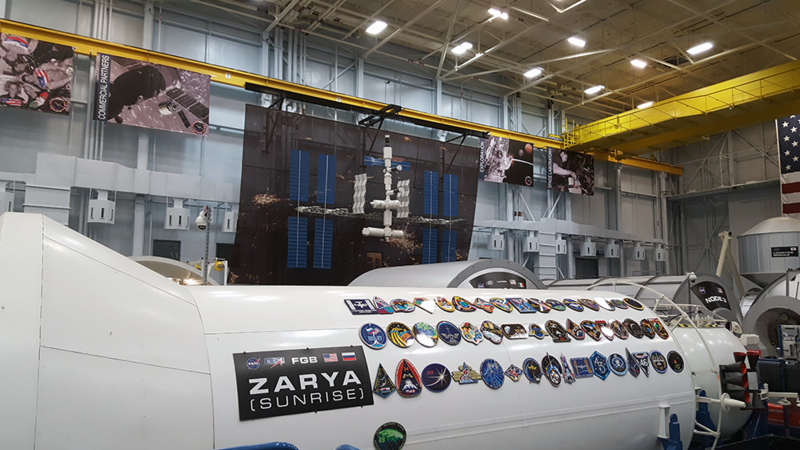 Training Module exterior with mission patches and model on display in the hangar.